FVB was retained by Dalhousie University to advise on the most economical and sustainable option for executing on their community feed in tariff (COMFIT) contract while simultaneously designing the renewal of their existing biomass steam Energy Centre which had reached end of life. It was ultimately decided that the preferred option involved converting the facility and the campus from steam to hot water. This included converting one of the existing oil-fired steam boilers to hot water, retrofitting campus building mechanical and controls systems and replacing the distribution piping system to utilize hot water. 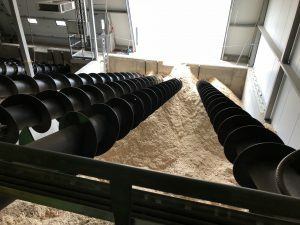 FVB chose a new 5.4MWt Biomass combustion boiler which generates hot oil that is circulated to an Organic Rankine Cycle Generator, producing 1.0 MW of electricity and 4.4 MW of eat. The 1.0 MW of power will be sold to the local electrical grid year round while the excess heat will be used to provide their campus with medium temperature hot water for space heating and domestic hot water. FVB completed the screening study, design, procurement assistance, and remains heavily involved as the principal site field inspector and Engineer of Record. A steam to hot water conversion was completed on the campus in 2017; the campus is now served by a hot water District Energy System which this Energy Centre feeds.